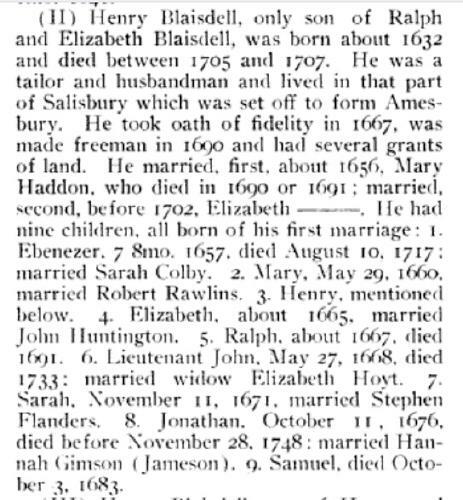 "Massachusetts Births, 1841-1915", database with images, FamilySearch (https://familysearch.org/ark:/61903/1:1:FXZN-KM5 : 1 March 2016), John Warren Guild, 1868. 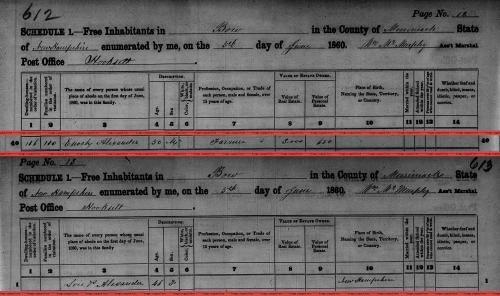 "Massachusetts State Census, 1865," database with images, FamilySearch (https://familysearch.org/pal:/MM9.3.1/TH-266-11775-87706-90?cc=1410399 : 1 April 2016), Norfolk > Dedham > image 109 of 122; State Archives, Boston. Sarah Gunnison was born perhaps about 1625. Rafael Gutierrez was born perhaps about 1955. Rafael married Julie Weiner, daughter of Norman Weiner and Rosalind L. Goodman. 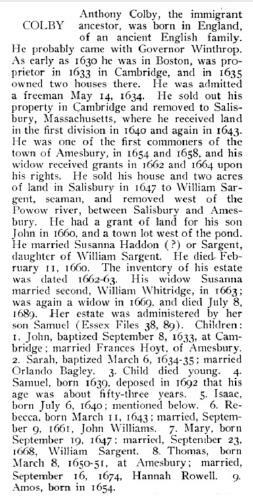 David W. Hoyt, The old families of Salisbury and Amesbury Massachusetts : with some related families of Newbury, Haverhill, Ipswich, and Hampton, and of York County, Maine / David W. Hoyt., , at https://archive.org/stream/cu31924025963772 . Providence, R. I.: Snow & Farnham, (1897) , p. 191. Mary Haddon was born perhaps about 1632. Frederick Lewis Weis, The Colby family in early America; early generations of the descendants of Anthony Colby of Boston, Cambridge, Salisbury and Amesbury, Massachusetts, 1595-1661, , at https://books.google.com/books?id=TXdGAAAAMAAJ . Caledonia: The Colonial Press, (1970) , p. 3. Nettie Gove Nicholson, A Tenth Generation Yankee from Maine, [West Palm Beach, Fla.]: ([1972?]) , p. 110. Unknown author, Boston Transcript (n.p. : n.pub., unknown publish date), 28 Apr 1926 #3808. Find A Grave Memorial# 63542102. 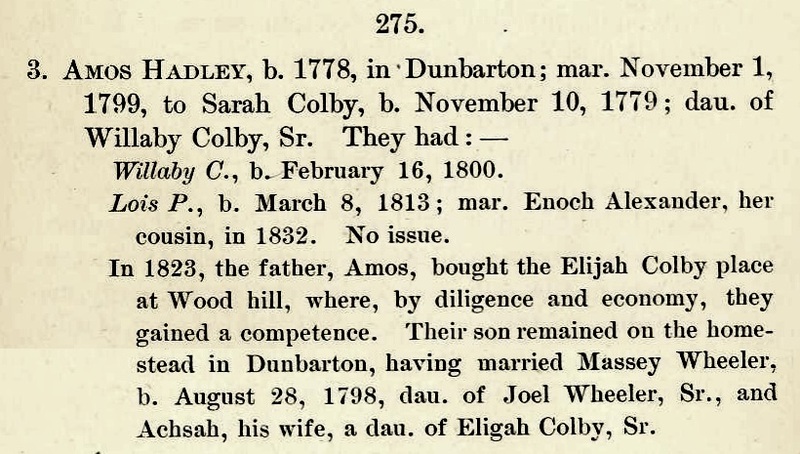 "New Hampshire Marriage Records, 1637-1947," database with images, FamilySearch (https://familysearch.org/ark:/61903/1:1:FL6K-75Z : accessed 16 April 2016), George H. Colby and Ellen M. Hadley, 29 Nov 1860; citing Milford, Hillsborough, New Hampshire, Bureau of Vital Records and Health Statistics, Concord; FHL microfilm 1,000,976. Sixteenth Census of the United States, 1940, Washington, D.C.: National Archives and Records Administration, (1940) , Census Place: Shrewsbury, Worcester, Massachusetts; Roll: T627_1653; Page: 2B; Enumeration District: 14-238A. living at 15 Grafton Street, Shrewsbury, Worcester County, Massachusetts. Hadley, John O (Ella G) bookkeeper in Worcester. house 56 Prospect. living at 56 Prospect, Shrewsbury, Worcester County, Massachusetts. Town and City Clerks of Massachusetts, Massachusetts Vital and Town Records, Provo, UT: Holbrook Research Institute (Jay and Delene Holbrook), , Worcester > Births, Marriages and Death > 4763. 1900 United States. Census Office. 12th census, 1900 population census schedules, Washington, District of Columbia: Bureau of the Census Micro-Film Laboratory, ([197-]) , Census Place: Worcester Ward 2, Worcester, Massachusetts; Roll: 696; Page: 15A; Enumeration District: 1723; FHL microfilm: 1240696. 1910 United States. Bureau of the Census. 13th census, 1910 population census schedules, Washington, District of Columbia: Bureau of Census Micro-Film Lab, ([19--?]) , Census Place: Worcester Ward 2, Worcester, Massachusetts; Roll: T624_631; Page: 17A; Enumeration District: 1863; ; FHL microfilm: 1374644. 1920 United States. Bureau of the Census. 14th census, 1920 population census schedules, Washington, District of Columbia: The National Archives, ([193-?]) , Census Place: Worcester Ward 2, Worcester, Massachusetts; Roll: T625_750; Page: 23B; Enumeration District: 208; Image: 758. 1930 United States. Bureau of the Census. 15th census, United States, 1930 federal census : population schedules ; NARA microfilm publication T626, Washington, District of Columbia: Bureau of the Census Micro-Film Laboratory, ([19--?]) , Census Place: Shrewsbury, Worcester, Massachusetts; Roll: 965; Page: 1A; Enumeration District: 263; Image: 702.0; FHL microfilm: 2340700. 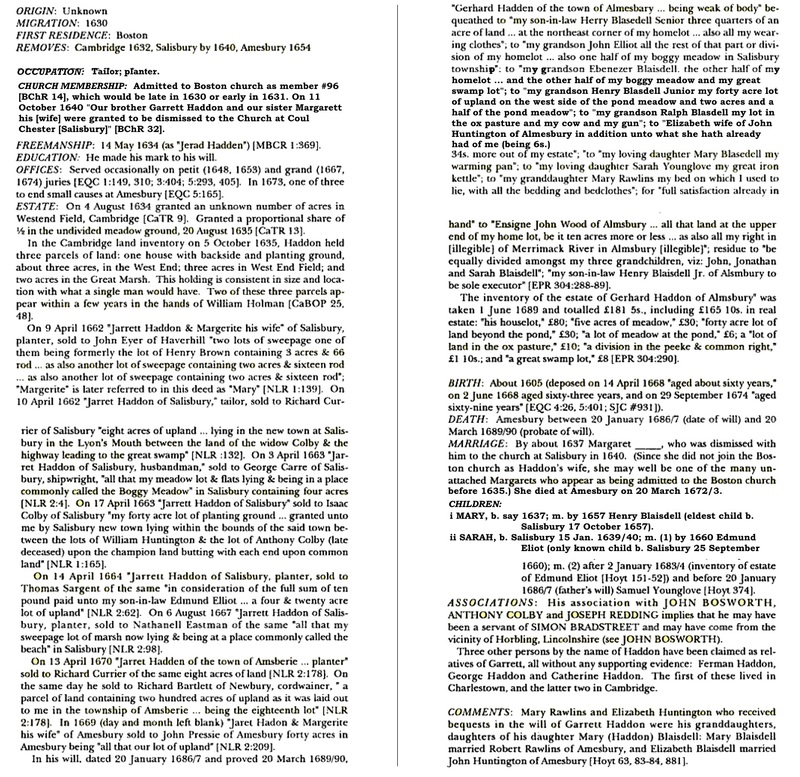 "Massachusetts, Births, 1841-1915," index and images, FamilySearch (https://familysearch.org/pal:/MM9.1.1/FX64-5LS : accessed 30 Nov 2012), Hadley, 1887. 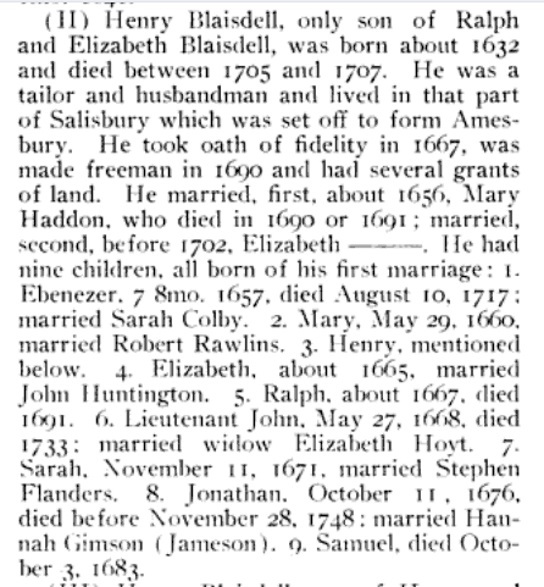 "Massachusetts, Births, 1841-1915," index and images, FamilySearch (https://familysearch.org/pal:/MM9.1.1/FXFF-P8L : accessed 30 Nov 2012), John O. Hadley, 1903. "Massachusetts Death Index, 1970-2003," database, FamilySearch (https://familysearch.org/ark:/61903/1:1:VZY1-1QD : 4 December 2014), John O Hadley, 04 Mar 1972; from "Massachusetts Death Index, 1970-2003," database, Ancestry (http://www.ancestry.com : 2005); citing Worcester, Massachusetts, death certificate number 018777, Commonwealth of Massachusetts Department of Health Services, Boston. 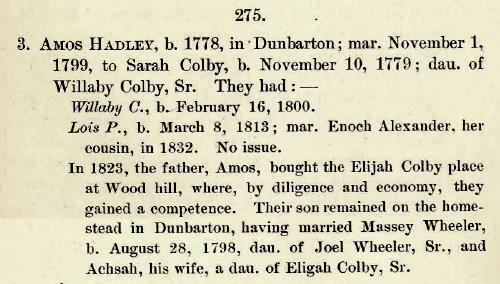 Martha Hadley was born on October 23, 1704 in Amesbury, Massachusetts. 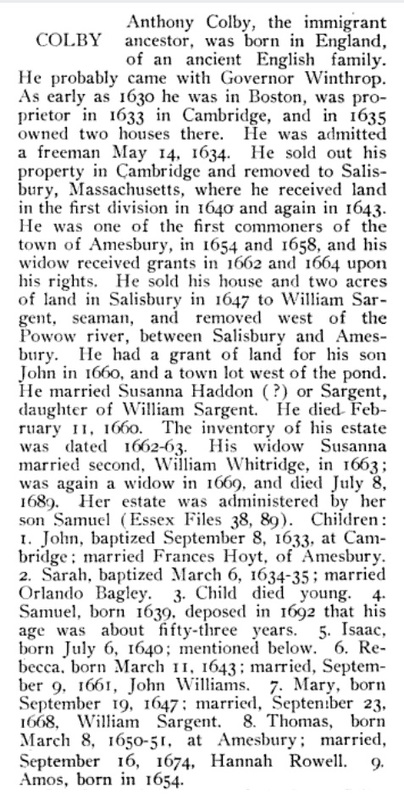 Martha married Phillip Sargent, son of Phillip Sargent and Mary Tuxbury, on July 23, 1724 in Amesbury, Massachusetts. 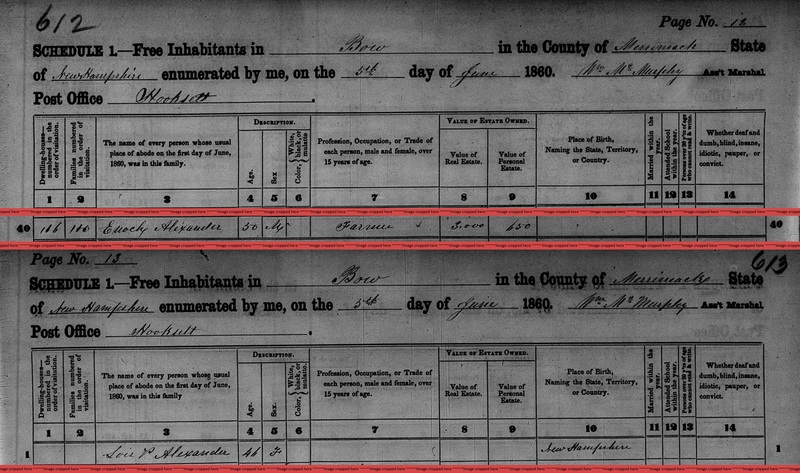 "Massachusetts, Births, 1841-1915," index and images, FamilySearch (https://familysearch.org/pal:/MM9.1.1/FX6X-4BQ : accessed 30 Nov 2012), Olive May Hadley, 1888. 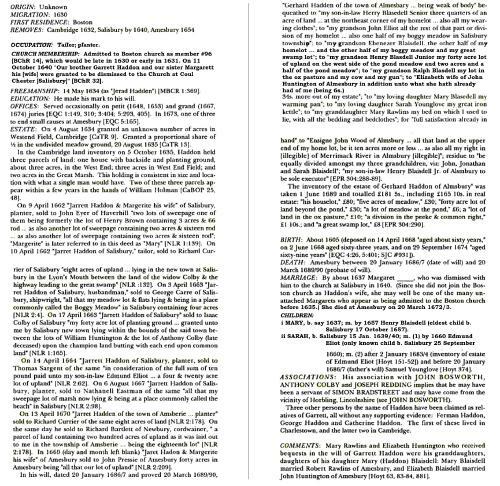 "Massachusetts, Marriages, 1841-1915," index and images, FamilySearch (https://familysearch.org/pal:/MM9.1.1/N4XN-CZV : accessed 30 Nov 2012), Arthur Clifford Webb and Olive Mae Hadley, 1915.